All of our chalets hold a minimum of 2 cats and we have 4 chalets capable of holding up to 3 cats. We also have adjoining double chalets that can be opened up to form one large unit which gives a family of 4 or more extra room. If you have two cats and would prefer that they have more room, the larger family pens are available to book at extra cost. All of the chalets have recently been refurbished and they now all have two interior shelves at right angles to each other at different heights and a ramp leading up to the sun shelf in the run. This allows older cats that may have trouble jumping the ability to benefit from the higher elevations. This enables them to enjoy the views out to the garden. At ground level the view from one pen to another is obscured so our residents do not feel threatened by the cats in adjacent pens. 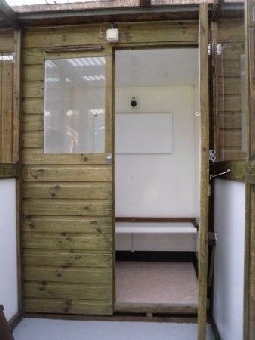 At higher levels the panelling is clear so that the cats can see down the length of the cattery. All chalets have an insulated indoor house which contains the cat bed or beds and is thermostatically heated in the cooler months. The heating is provided by a pet safe panel heater. The outer runs provide plenty of space for the cats to stretch, and are also covered to keep the area dry but are open to the fresh air in the summer months. In the winter, further protection is added to guard against strong winds and the cold. We take security very seriously and the pens are individually padlocked and then the entrance to the corridors is locked with a combination lock, furthermore the exterior door to the cattery also has a lock on it. 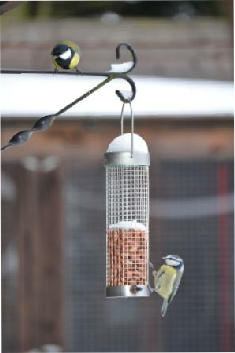 All the chalets overlook the gardens where we have bird tables and bird feeders which bring in a lot of wildlife for the cats to watch. In the summer months hanging baskets also provide a haven for butterflies. We also have a small flock of free range chickens in the garden which provide amusement for the cats and also a few eggs for our customers when they are laying.